Join one of our five star rated watersports adventures in Dorset. 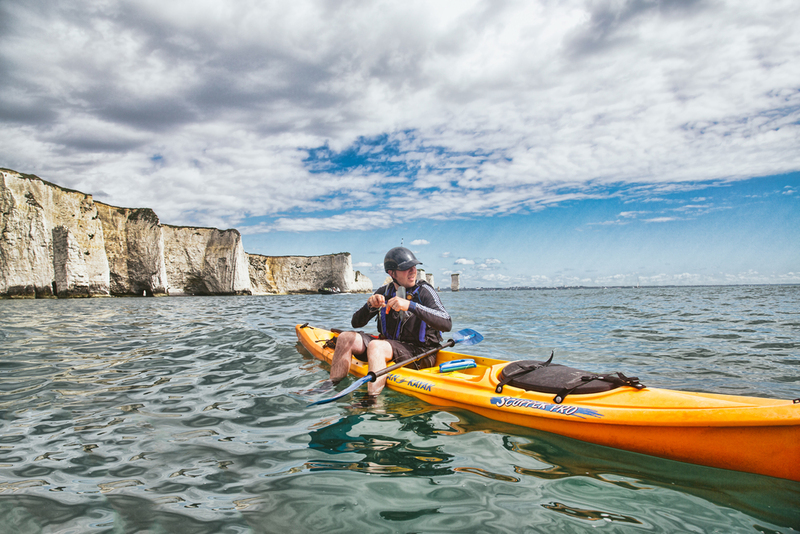 Jump aboard our kayaks to explore the sea and shore of Studland and the iconic Old Harry’s Rocks - explore the famous sea stacks, navigate the caves and paddle through the arches in kayaks like pirates have done before us. If you fancy testing your balance this can all be done from a stand up paddleboard too (SUP). Where we can get wet is where we are happiest, and our patch of Dorset’s Jurassic coastline is our playground. Whether in it, on it or under it, our watersports adventures will have you exploring the sea and its shore as well as the life that inhabits it, so you can see the world from a different perspective. Our beautiful location on Middle beach in Studland means we are the closest provider to Old Harry Rocks, a beautiful and iconic chalk stalk, this ensures a scenic and sheltered journey by kayak to explore the sea stacks, caves and arches. What’s in the water is also pretty darn exciting and we have some adventures that will get your tummies rumbling. We’ll investigate the life in our bay through foraging from our kayaks, identifying and collecting edible plants, seaweeds and foraging for shellfish and crabs as we set our shrimp and lobster pots. You’ll be brimming with knowledge on what to look out for along our shores as well as the all important preparation techniques. Learn what sea plants are edible and what their uses are. We have some expert kayak fishing instructors on the Fore/adventure team so you're in the best hands to try and catch your lunch or dinner. We’ll be fishing off the kayaks using rods or handlines for delicious fresh fish such as black bream, seabass and mackerel which, if you can't wait to take home to cook, we can arrange a wild cooking session to cook up your fishy feast alfresco on the beach! Under the water is a whole new world to be explored, so join us on a snorkellling Adventure, you will be kitted out and set to explore our shores; from seaweeds to seahorses, crabs to cockles and everything in between. Journeying on our stand up paddleboards is like a magic carpet ride on the sea, if you ever wanted to tell your pals you walked on water then this is the adventure for you. 2 hour - Half day activities are priced between £35-£70 per person and full days are £90-£120 per person and can be booked through the bookings page. Most of our kayak adventures are for age 12+ but if you are looking for a family adventure with younger children then head over to our small human page.